Enjoy a visit to a Hendersonville NC apple orchard in the Blue Ridge Mountains in Western North Carolina! All groups are welcome. Admission is free to visit the farm and pick or shop for apples and apple goodies. 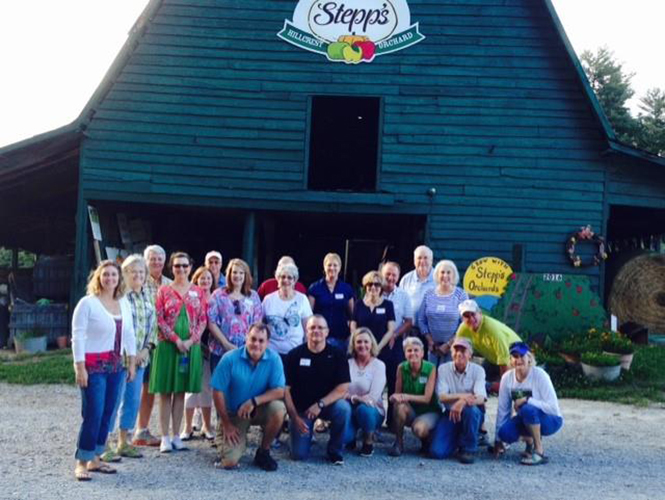 Your group can take a guided farm tour, ride on the farm wagon through acres of orchard and Farmer Stepp’s pumpkin patch and grape vines. Drink a cup of delicious local fresh apple cider. Please call for reservations. Adult guided tours are scheduled in the afternoons on weekdays, Saturdays during the day and Sundays after 1 PM. Guided tours are $6 per person and require a minimum of 20 people.